Made with the best, all-natural ingredients, EcoMobility™ is highly-absorbed joint relief and support for dogs who are older, heavy, or genetically predisposed to joint problems. Finally, an inexpensive and easy-to-use option to ensure your pup gets the hip and joint support they need to stay in optimal agile health. Simply add this powerful supplement to your dog’s food once per day to promote maximum mobility. Joint problems can be debilitating to for dogs as they age. Being the playful and energetic creatures they are, the shock of suddenly losing the ability to run outside and play with mommy and daddy can be a tragic change to lifestyle for our four-legged friends (and pet parents)! That’s why if you have a hefty dog, one who’s aging, or a dog from a family line or breed with known joint issues, EcoMobility should be an essential supplement to his daily meals and nutrition plan. Now, you can stop stressing and give your best buddy the support they need to return to the energetic, happy fur baby you love. Avoid the expensive visits to the veterinarian, costly anti-inflammatory drugs, or even serious surgical options down the line by ensuring your dog gets proper joint supplementation now, while complications are still preventable. Our ingredients are all natural, safe, and proven effective. We believe your dog deserves only the very best. That’s why EcoMobility is packed with an assortment of flexibility enhancing and comfort-boosting ingredients, including optimal amounts of Glucosamine and Chondroitin along with MSM for superior performance. Your pet is a member of your family, and like any loved one, you want your dog to be in good health for years to come. With EcoMobility, you can rest easy knowing your pup has the support they need to thrive. NOTE: EcoMobility should only be used on pets 12 weeks and older - we do not recommend this product for puppies younger than 12 weeks. Order EcoMobility today, and we’ll have your package wrapped up and on its way! EcoMobility™ Joint & Hip Complex Supplement contains only natural and naturally-derived ingredients, which means that your pet is not ingesting any harmful chemicals and artificial preservatives. Our concentrated formula is quickly absorbed. Simply add the recommended dosage per 15 pounds of body weight to your dog’s food each day. EcoMobility™ Joint & Hip Complex contains only natural and naturally-derived ingredients, which means that your pet is not ingesting any harmful chemicals and artificial preservatives. Our concentrated formula is quickly absorbed. Simply add the recommended dosage per 15 pounds of your dog's weight daily to their food. Liver can provide your dog with protein, fat and vitamin A, all of which help him stay healthy. Not only is it packed with nutrients like copper, iron, niacin, phosphorus and zinc, it also tastes yummy! Chondroitin Sulfate is an important structural component of cartilage and provides much of its resistance to compression - assisting in slowing the breakdown of cartilage that causes pain and lack of mobility. Along with Glucosamine & MSM, they can promote joint and cartilage heath, helping to lubricate and keep them supple. Dogs suffering from hip dysplasia, bone fractures, arthritis and other degenerative bone problems can benefit from administration. White Willow Bark is the source from which aspirin is extracted and often can used as a natural painkiller substitute. White Willow Bark is an herb with natural antibiotic and pain-relieving properties and has been used successfully for many years to relieve arthritic pain and inflammation in pets. A powerful and potent botanical with antimicrobial and anti-inflammatory properties used to treat pain and inflammation and slow the damage to cartilage in arthritic joints. An important component of joint fluid, Sodium Hyaluronate promotes healthy joints and cartilage resilience, including cartilage's ability to resist compression. It may protect the joint by increasing the viscosity of the joint fluid (increasing the thickness of the fluid therefore offering additional cushioning for the joint) and reducing inflammation. Manganese Sulfate is a vital mineral that supports your dog’s nutrient metabolism, nervous system function, and normal bone development while helping to alleviate inflammation due to arthritis. Bioperine® is a patented extract obtained from black pepper. This important nutrient has many benefits including aiding in absorption of nutrients in the body (so your pet gets the most nourishment possible), metabolism support , and help in keeping a healthy GI tract. Vet Organics uses food grade silica which is chemically inert, stable, won’t leach into food, or off-gas. Silica does not react with food or drinks or produce any hazardous fumes. 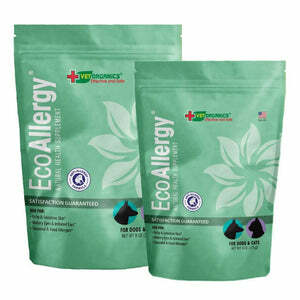 Apply EcoMobility daily to your dog's food to support flexibility and comfort, while helping to promote maximum mobility.